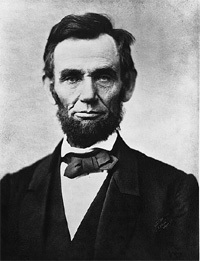 In the second year of the American Civil War, President Abraham Lincoln issued the following letter to the Governors of the 17 states that were still in the Union. The quota of men who were to be supplied from each state was actually listed separately in a document issued by the War Department on July 7, 1862. The quota for the State of Indiana was 9 regiments of Infantry, approximately 9,000 men in all. One of those regiments was the 80th Indiana Volunteer Infantry Regiment, which was formed in August 1862. Gentlemen: Fully concurring in the wisdom of the views expressed to me in so patriotic a manner by you in the communication of the 28th day of June, I have decided to call into the service an additional force of 300,000 men. I suggest and recommend that the troops should be chiefly of infantry. The quota of your State would be ______. I trust that they may be enrolled without delay, so as to bring this unnecessary and injurious civil war to a speedy and satisfactory conclusion. An order fixing the quotas of the respective States will be issued by the War Department tomorrow. All Rights Reserved. Created March 30, 2000. Last updated November 29, 2004.